The results from the 2018 TWS Council elections are in. TWS members have elected Carol Chambers, a past two-term Council member for the Southwest Section, as the next vice president of TWS. Evelyn Merrill will join Council as the Canadian Section representative, Mike Conner was reelected as the Southeastern Section Representative and Jim Ramakka will be the Southwest Section Representative. The three bylaw amendments up for consideration were approved: Members agreed to remove proxy voting by Council members, change the number of Council members that constitutes a quorum from five to nine and change the Council nominations process to provide additional time for the nominating committee to identify and select candidates. TWS extends its thanks to all of the candidates who ran for office, including Gordon Batcheller, Malcolm Lau, Lara Pacifici and Whitney Gann. The election winners will begin their term during the Members Meeting at the 25th Annual Conference this October in Cleveland, Ohio. Meet your new Council members! For many of us, a love of wildlife took us outside at an early age and gave us unforgettable moments observing animals. Turning this passion and enthusiasm into a career as a wildlife professional has given me great joy and satisfaction. I love what I do, I constantly learn, get in the field and work with students starting their careers in wildlife. At the same time that I found my career path in college, I also connected with The Wildlife Society. An adviser suggested I attend a TWS meeting. Not long after, I gave my first presentation at a state chapter conference in 1992. Since then, my involvement extended to working with TWS in capacities that ranged from Student Chapter Adviser to Southwest Section Newsletter Editor, Committee Chair for annual meetings, Symposia Organizer, Women of Wildlife (WOW) supporter and more. As a two-term TWS council member, I represented the Southwest Section, traveling among states and getting to know people and their interests in the chapters that I represented along with the section’s business, challenges and ways to address questions and concerns from our membership. My long-term involvement in TWS gives me an understanding of the people, issues, agencies and organizations involved in wildlife management and conservation and the daily administration of TWS at all levels. It gives me a strong interest in seeing TWS remain robust and increase recognition of members as Leaders in Wildlife Science, Management and Conservation, as our motto reads. My views for TWS are threefold: to support science-based wildlife management, encourage diversity and increase communication and networking. The first echoes the mission of TWS: to promote our use of sound, science-based management and conservation to sustain wildlife and habitat. I want our science recognized among policy makers and used on the ground. The second encourages us to greater diversity in our profession through support of underrepresented groups and WOW in our organization. The backing that TWS and TWS members provide to students at our annual, section and state conferences makes us stand out among professional organizations and gives us a very strong, positive reputation among the next generation. This benefits both diversity and networking, a third part of my views. Maintaining and building support for our students and early career professionals will grow membership and networks, strengthening future membership and their contributions so important in our profession. In addition, communicating our passion about our jobs, wildlife and the issues challenging many animal species can extend beyond our own circle to policymakers and the public. From my experience and knowledge of our membership and our priorities, I am prepared to be an effective leader of TWS. First, we need to continue to strengthen Canadian perspectives in TWS to promote the true value of wildlife in North America both now and into future. Second, Canadian issues need to be adequately represented and addressed. Not only do we have distinct ecosystems, but our cultural and political systems afford unique challenges and solutions. Third, Canada’s long wildlife legacy and our experience can benefit our neighbors. For example, we have continued to manage some wildlife populations that our southern neighbors only recently restored. On the other hand, the importance of TWS backing in promoting local wildlife resources from a North American perspective when quagmired in local politics is not to be underestimated. Fourth, as our world continues to globalize, conserving the earth’s biota will depend on international collaboration. Strong international teamwork within TWS will put the Society at the forefront in meeting future challenges. Since coming to Canada 18 years ago, I remain in awe of the vast but fragile Canadian wildlife resources, the cultural diversity, and the impassioned and close-knit wildlife professionals who work to conserve them. The Wildlife Society has been a part of my life for the past 40 years and I have seen the opportunities the Society has offered to young and seasoned professionals alike. Given my background at the various Chapter and Section levels in Canada, I hope to help promote the Section’s role as a full partner in TWS that will provide a North American synergism to tackling past and emerging wildlife issues head-on. 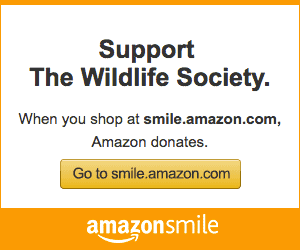 It is an exciting time to be a member of The Wildlife Society. Our membership is growing, we are on sound financial footing, TWS staff is making great strides in all aspects of TWS affairs, student involvement is phenomenal, attendance at annual meetings is excellent and member benefits continue to grow. I will be honored to serve our membership to the best of my ability and I commit to recognize past successes and build upon our current strengths to ensure our Society remains valuable to all members. It is my desire that TWS be viewed as an essential professional resource for all student and practicing wildlife biologists. Understanding that the strength of TWS emanates from its membership and that many chapter members are not members of TWS, I will encourage membership at all levels of TWS by listening to our membership, working to address concerns and promoting open lines of communication between subunits and TWS. During nearly three decades as a member and more recently as your Section Representative to council, I have witnessed many changes in The Wildlife Society. Among the most positive of these changes has been student involvement in TWS. I pledge to maintain and enhance student involvement in TWS activities and I will encourage members in our section to promote The Wildlife Society as a means of ensuring that our Society continues to represent and serve those who lead the charge in conserving wildlife and their habitat. The area encompassed by the Southwest Section of The Wildlife Society contains a complex suite of issues facing wildlife managers. While public land is often a factor influencing wildlife programs in Arizona and New Mexico, private land is a primary consideration in wildlife management in Texas. Some issues including effects of drought, invasive species and the proposed border wall are concerns in all three states as well as Mexico. Other issues may be unique to a state or region. Based on my experiences attending 23 of the 24 TWS annual conferences and three of the five International Wildlife Management congresses, wildlifers generally share the same passion and devotion to our profession and the resources we manage, no matter where we work. I’ve seen how participation at all levels of The Wildlife Society can lead to the development of professional relationships that facilitate the common goal of scientific management, even across political boundaries. I’ve observed the vital role TWS staff play in advocating for wildlife and agency budgets before Congressional committees, and council’s responsibilities in overseeing the functioning of TWS. Council meetings are a primary venue to discuss issues of concern to the membership. I’m also aware of the work and time commitment expected of Council. Past SW Section Representatives have been very effective on Council in conveying Southwest Section concerns and in advocating initiatives such as the WOW program and outreach efforts to encourage Native American students. I will do my best to carry on their legacy.